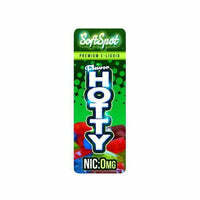 What flavors come to mind when you read the name “Hotty”? If you’re thinking of jalapenos and ghost pepper you may be disappointed. However, for the fans of tasty fruit flavors, you’ll be happy to know that Hotty is the blend of watermelon and green apple, delivered through the Soft Spot collection of e Juices. E juice perfectly describes this offering, over the standard “e liquid” because juiciness is all you’ll experience by combining these sweet, tart, and refreshing flavors, rolled into one. The presence of watermelon gives the mist a sweet, yet mild juicy base that is synonymous with the most refreshing members of the melon family. As you know, watermelon is the best accompanying flavor for a hot, summer day. It doesn’t overpower you but leaves you gently satisfied with a cool, mellow approach to your vaping experience. But the name “Hotty” wouldn’t be applicable if Sejuiced didn’t throw a little punch of sour into the mix to tingle your palate. This is where the tart, granny smith apple flavor makes a bold introduction to this mellow mist. Your tongue will get a little kick of tartness as it blends, beautifully, with the sweet, refreshing juices of the watermelon flavor. The watermelon takes the driver’s seat to ensure this flavor goes down smoothly without too much of a kick from the sour apple. Upon exhale, the sour apple leaves a lasting impression on the tip of your tongue, for a savory sizzle that'll perk you right up.